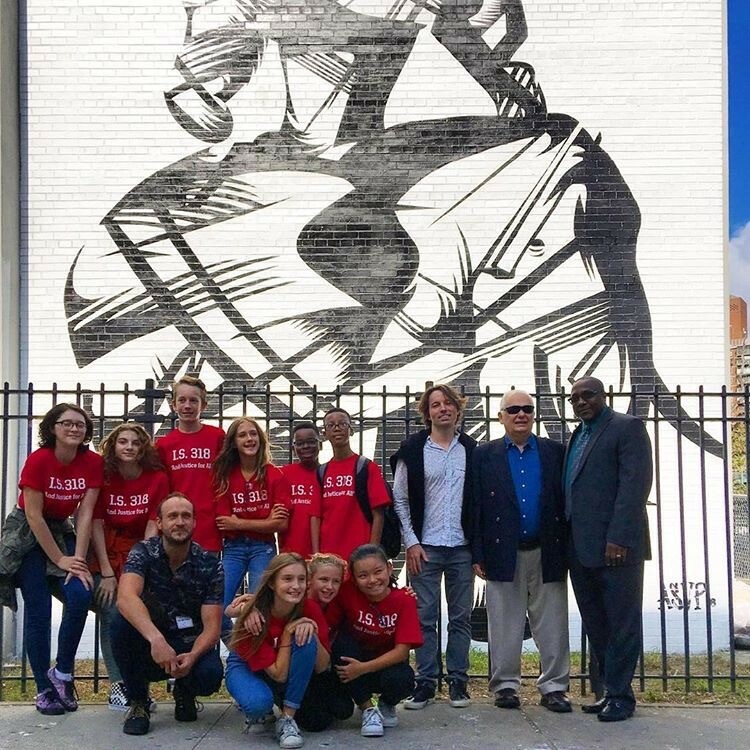 Following this summer’s debut of “Equilibrium,” a 5-story tall sustainability-themed mural painted on the exterior of Intermediate School 318 in Brooklyn, NY, street artist duo ASVP is offering a limited edition print run of the artwork to benefit the local Parent-Teacher Association. Located in the Williamsburg neighborhood of Brooklyn, IS 318 is a Title 1 school, meaning at least 40% of students come from low-income families. “Equilibrium” was one of two murals painted at the school as part of #THEPOINTNYC, a Climate Week NYC project produced by Greenpoint Innovations in partnership with Comics Uniting Nations, Hypokrit Theatre Company, Rattlestick Playwrights Theater, and the United Nations Children’s Fund (UNICEF). Both murals are intended to engage youth and the local community with global issues surrounding climate change. 15” x 20” signed prints from this special limited run are available starting today at Walk the West (150 Franklin Street), an independent retailer in Greenpoint that sells vintage and upcycled clothing, and also online. On display in-store is a single larger print (33” x 45”), which is also available for purchase. Contact us at info@greenpointinnovations for more details. Join us on our social media channels for updates.